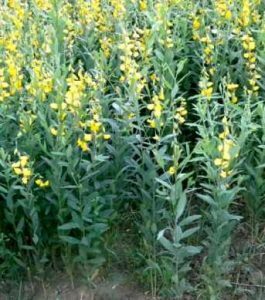 Crotalaria juncea, known as brown hemp, Indian hemp, Madras hemp, or sunn hemp, is a tropical Asian plant of the legume family (Fabaceae). It is generally considered to have originated in India. It is now widely grown throughout the tropics and subtropics as a source of green manure, fodder and lignified fiber obtained from its stem. Sunn hemp is also being looked at as a possible bio-fuel. It can be an invasive weed and has been listed as a noxious weed in some jurisdictions.